American SSTO VTOVL orbital launch vehicle. 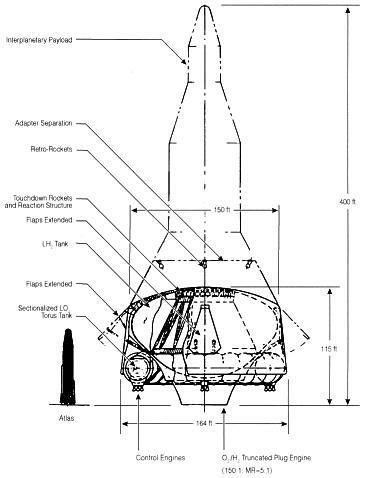 Early 1960's recoverable launch vehicle proposed by Krafft Ehricke at General Dynamics. Perhaps the largest conventionally-powered launch vehicle ever conceived, it was designed to deliver 900 metric tons to low earth orbit. Status: Design 1962. Payload: 450,000 kg (990,000 lb). Gross mass: 21,820,000 kg (48,100,000 lb). Height: 122.00 m (400.00 ft). Diameter: 45.70 m (149.90 ft). Span: 50.00 m (164.00 ft). Fully fueled, it would weigh as much as an ocean-going freighter. It would carry a 900 metric tons to orbit, allowing it to launch a spaceship bound for Mars. This behemoth would have a diameter of 50 m with its height approaching that of the Washington Monument. It would fly as a single-stage launch vehicle. Fully recoverable, it would touch down in the ocean following a return from orbit. Parachutes would slow its descent. Retro-rockets, firing during the last seconds, would assure a gentle landing. LEO Payload: 450,000 kg (990,000 lb). Family: orbital launch vehicle, SSTO. Country: USA. Agency: Convair.